Synthetic peptide within Human SOCS6 aa 500 to the C-terminus (C terminal). The exact sequence is proprietary. Our Abpromise guarantee covers the use of ab53181 in the following tested applications. Perform heat-mediated antigen retrieval with 10mM citrate buffer for 10 minutes, followed by cooling at room temperature for 20 minutes. SOCS family proteins form part of a classical negative feedback system that regulates cytokine signal transduction. May be a substrate recognition component of a SCF-like ECS (Elongin BC-CUL2/5-SOCS-box protein) E3 ubiquitin-protein ligase complex which mediates the ubiquitination and subsequent proteasomal degradation of target proteins. The SOCS box domain mediates the interaction with the Elongin BC complex, an adapter module in different E3 ubiquitin ligase complexes. 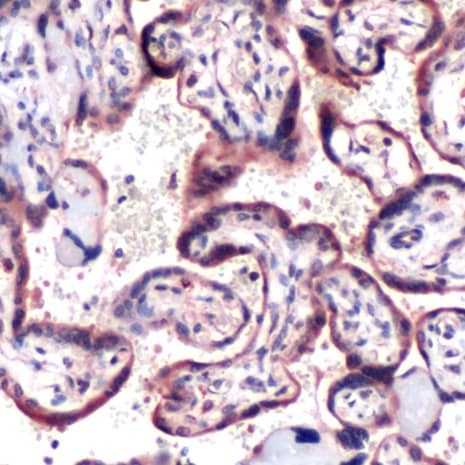 Immunohistochemistry (Paraffin-embedded sections) of ab53181 staining human placenta. Publishing research using ab53181? Please let us know so that we can cite the reference in this datasheet. There are currently no Customer reviews or Questions for ab53181.